Louis Tomlinson's sister Lottie has shared a birthday tribute to her late mother on Instagram, two weeks on from her sister Félicité's tragic death. Makeup artist Lottie posted a photo of her mother Johannah Deakin, who lost her battle with leukemia three years ago, on what would have been her 46th birthday on Monday. 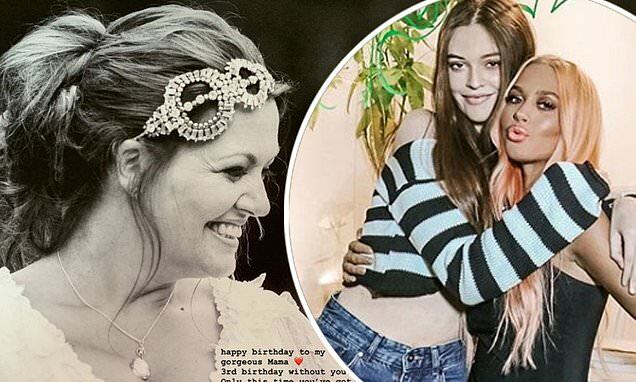 Lottie wrote that she hoped her 'gorgeous mama' was celebrating with 'gorgeous Fizzy,' the family nickname for Félicité, 18, who died from a suspected heart attack on March 13. 'I love you more now than ever and I take every lesson you taught me through like. Thank you for everything Mama x'. Lottie's younger twin sisters Daisy and Phoebe, who turned 16 last week, also shared their own tributes on their social media pages. Johannah, passed away from leukemia aged 43 in December 2016, leaving behind Louis, Félicité and their five siblings. The midwife had split from Lottie, Félicité, Phoebe and Daisy's father Mark in 2011 and was married to doctor Dan Deakin in July 2014. They welcomed twins Ernest and Doris the same year. Félicité passed away after she collapsed from a suspected heart attack at her apartment in Earls Court, West London on March 13.